After the revolution of December 1989, the citizens of Romania had an abundance of new opportunities. Each individual had the chance to think freely, to act freely, and to choose his or her way of life. In this spirit I started something new myself: studying the art of stained glass. It was a difficult transition, and the lack of available materials made it next to impossible. As a result I turned to a "faux" stained glass, which uses a paste I developed to simulate lead along with a paint to simulate glass. Although the colors will fade somewhat over time, the result is an inexpensive window. I now have eight years of experience with this technique. In the year 2000 I started building true leaded windows, but I have to manufacture the lead came myself! In 2003 I discovered Glass Eye 2000 and began to use this program for all my drawings. The software was amazingly easy and intuitive. Before long I joined the Glass Eye 2000 discussion group and started making new friends. Through members of the group I even received some useful materials such as copper foil and glass. Glass Eye 2000 is an extraordinary program, certainly the best on the market, and I use it for every work I construct. 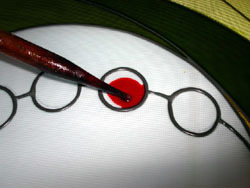 Although designed for "true" stained glass, it works perfectly for "faux" stained glass as well. The program gives my clients a very good idea of what the finished product will look like. With the help of this program I have constructed hundreds of windows, and last year I got a commission to do a large work for a customer in Germany. Being from Germany she had easy access to the necessary materials, and as payment she provided me with new tools for my studio as well as several sheets of Spectrum glass. Romania is a poor country, and the people here are eager to learn from the West. We hope to join the European Union, which would certainly lead to the development of this wonderful art. 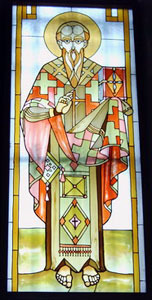 Currently I cannot find colored glass and the necessary materials for authentic stained glass in my country. There are very few people in this country who work with stained glass. The Romanians have only recently begun to appreciate stained glass as well as some related crafts; for example, sandblasted glass or objects constructed with copper foil: lamps, mirrors, flower vases, candle holders, etc. Maybe in the near future enough changes will occur here to make the necessary materials available. The emergence of the Internet has caused people in Romania to be more interested in new things, new ideas, new conceptions. They are thirsty for knowledge. A lot of new building is underway and there are a lot of new perspectives. But as things stand now, I’d estimate than a half of our population doesn’t even know what stained glass is! 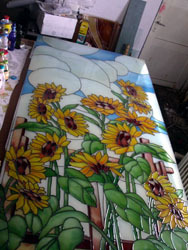 I’m currently one of only two artists working with stained glass in the northern part of Romania. My "Design of the Month" image of Jesus is part of a series of ten designs for a Christian Orthodox church in my town, a church still under construction. Using Glass Eye 2000 I printed actual-size drawings with realistic colors and built the window based on those printouts. The technique I use is simple. 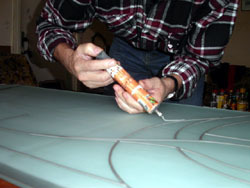 I scan my hand-drawn image, place it as background, trace the design, and make the final adjustments. I can usually complete a drawing of this size in only six to eight hours, which is far less than it would take without Glass Eye 2000. It's a priceless tool which I use for every project. I am 51 years old and live in Suceava, Romania. 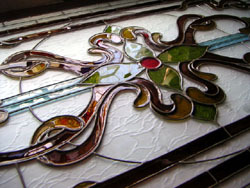 I worked as an interior designer until 1993 when I discovered the art of stained glass. I have taken no classes and what I know about stained glass I have learned myself. I am retired and have a little workshop where I make stained glass (lead came and copper foil), faux stained glass, and sandblasted glass. My email is vlepkaliuk@yahoo.com.au.